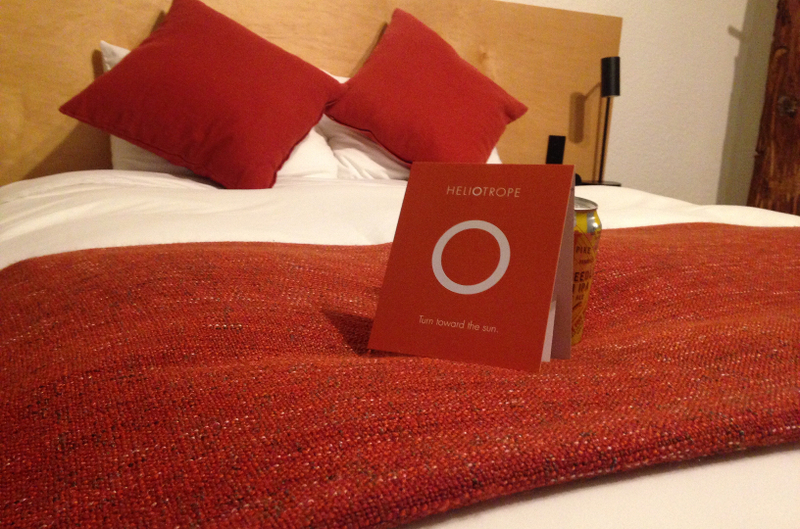 Local writer Marin Johnson enjoys a midweek staycation at The Heliotrope Hotel. I was blown away by how a creative group of minds can reinvent the hotel experience. My stay was in the Huckleberry Room, located just across from the Lawn and two steps away from The Hub. Every room offers something a little bit different, listed in detail on the website. My Flora Room came with a wet bar, single cup coffee maker, mini fridge, microwave, TV, Bluetooth speaker, and generous work space - the perfect place to work away from the office. Guests receive an email with their door code, parking information, and Wi-Fi password the day before their visit. Three worries out of the way. Check-in and check-out are just formalities. No room key means no need to visit the front desk immediately upon arriving. Park on property, make yourself at home, and then connect with The Heliotrope’s friendly staff at your convenience. Daily housekeeping is 100% optional! No surprise interruptions and less waste of natural resources. Certain rooms are pet-friendly (and others fur-free) so your whole family can get away together. The Heliotrope is across the street from a convenience store. No toothbrush, power cord, or snack? No problem! The heater/fan/AC is super quiet and comes with a remote so you can even adjust the temperature from bed. A full-length mirror makes it easy to dress up for important events. The workspace/breakfast nook is big enough for two people to work comfortably. An in-unit mini fridge and microwave, and a ton of local delivery options, saves time on acquiring food. A wet bar with a fill-your-own growler, ice bucket, glasses, a sink, and bottle opener makes it easy to retire from a long day. The Baker Suite is in a secluded corner of the hotel and has a separate living room – perfect for conducting meetings. Soft doesn’t begin to cover it. I’d say it was like a dream, but it was very real. The bed was downright cushy. It made an inaudible cush as it coaxed me off to sleep. Bluetooth speaker and outlets right next to the bed? Yes please! Handcrafted tree coat hangers - what an elegant way to keep my bags off the floor! Decorations change with the seasons. Fall brought in fresh evergreen trimmings and festive, local squash. The staff leave little surprises for birthday people, brides and grooms, Heliotrope regulars, VIP’s, and guests who are just plain lucky. If you need an early check-in or late check-out, the Heliotrope staff will do their very best to make it happen. The fire pit on the Lawn is a popular spot to gather and meet fellow guests, even in the rain. The staff makes sure there is always a warm fire to gather around, outdoors or indoors, whatever you prefer. Guests can clean up their bikes after a day of mountain biking with the convenient Bike Wash Station, and lock their bikes up in an indoor Bike Closet, both provided by popular demand. In The Hub, local complimentary coffee and tea is available 24 hours a day by Bellingham Coffee Roasters and Flying Bird Botanicals. I was truly blown away by the creative drive behind this hotel. They listen to their guests and are making improvements all the time based on their suggestions. It has the atmosphere of a cozy bed and breakfast but the thoughtful design and personalized service of a luxury hotel. And if you don’t want to take my word for it, read this review by Heliotrope regular, Will Beeler.